Oops, I meant to blog about this on Wednesday and now it's Friday. Holy batballs Robyn - what happened to this week? What's happened to this year? Can you believe that we are heading into the last few days of Summer? Not that it feels like there is even a whiff of a hint of Autumn in the air just yet given the fact that I am sitting here writing with sweat literally running down my back. Ewww, sorry. That's probably not the most glamorous mental image for me to encourage you to explore. Let's talk about pretty flowers instead huh?! 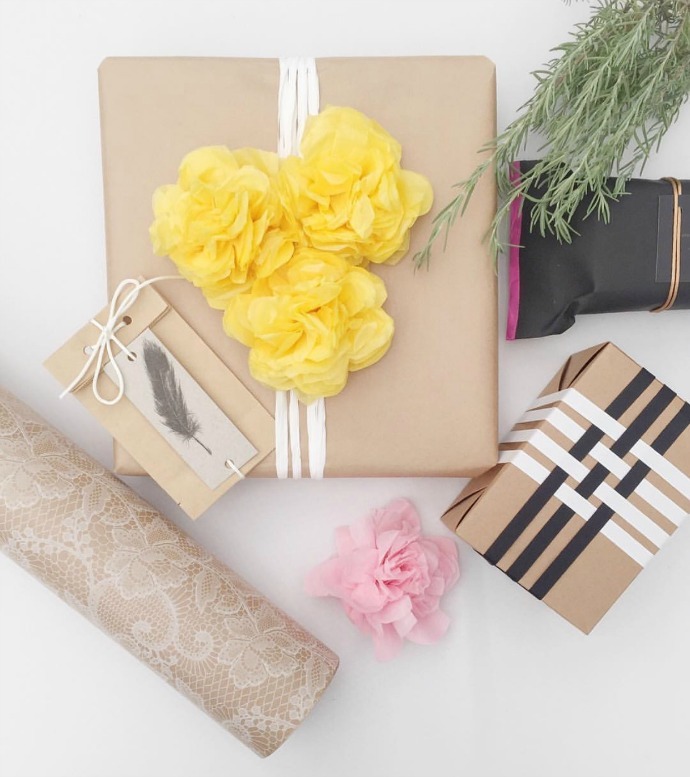 Earlier this week, Tessa and I presented a workshop at Reed Gift Fair in Sydney and we spent a glorious hour teaching people how to fancy up your gift wrapping with various embellishments. 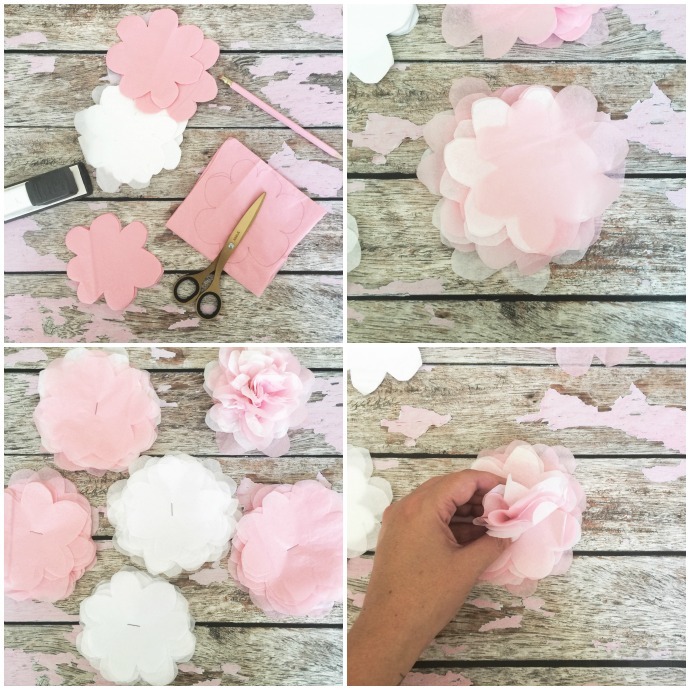 One of the things we taught our audience to create was the humble paper flower and their enthusiasm practically knocked my socks and knickers off! I have to admit, they are pretty darn cute! Even better is the fact that they are like dead set seriously easy to make. Even my eight year old 'completely uninterested in anything other than football' son can pull these off with next to no help. 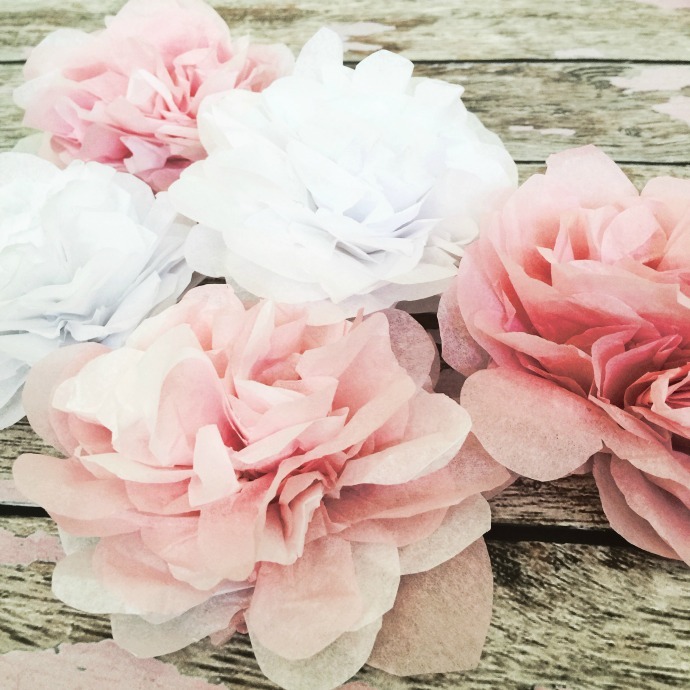 In case you haven't made these before for yourself, I thought I would share a quick DIY so you can learn how to make your very own paper flowers. Fold your tissue paper into squares until you reach a thickness that feels full in your hands, but you can still manage to cut with scissors. 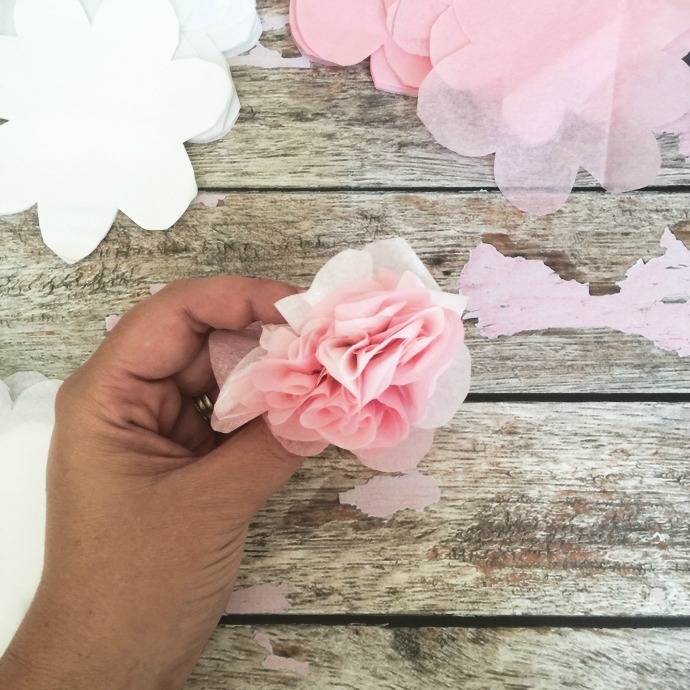 Freehand or trace a flower design onto the top layer of paper. Please don't worry about it being all perfectly shaped and stuff as I actually think the more imperfections, the more realistic your flower will look. 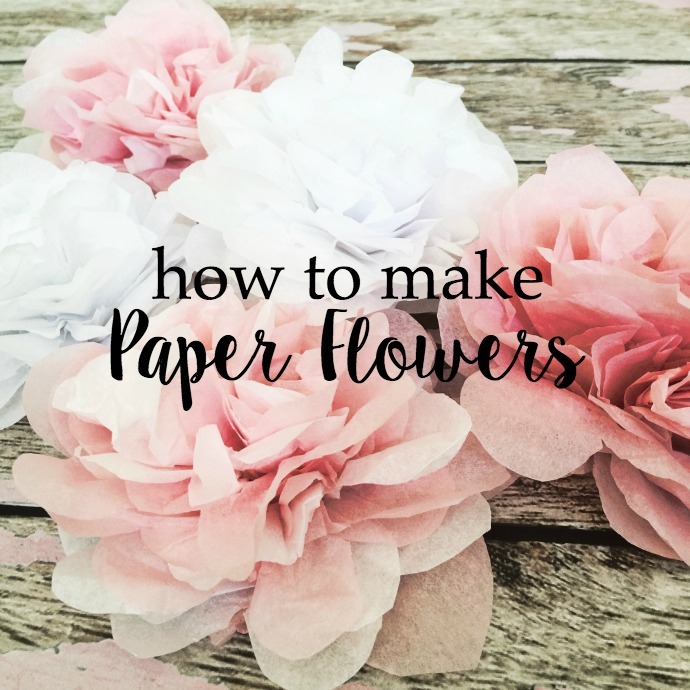 Cut out your flowers and separate them into piles of say approximately 20 sheets. I like to mix layers of white flowers into layers of pink to get a more textural look, and just a heads up - don't line up the flowers perfectly either, you want them to be loosely grouped together. Staple once into the centre of your piles... and now you get to start the fun part - the paper scrunching. Start with the top piece and pull it up into the centre and away from the others layers, slightly crushing it at the base to keep the shape. Continue doing this to every layer with slightly less crushing on the final two layers. All that's left to do is fluff your flowers up to achieve the finished look you would like.. and then go nuts and make a shitload more. 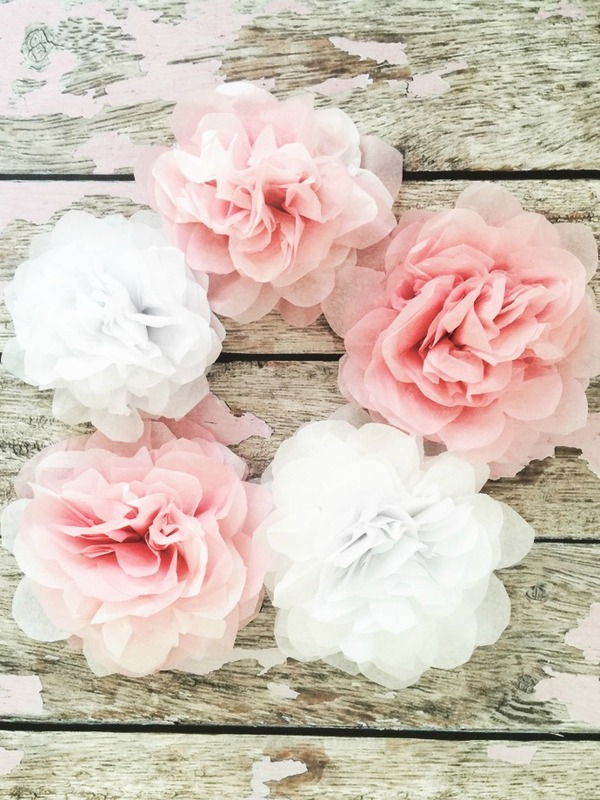 You can top a gift with them, pop them on top of a pretty mug or cup or even stick some floral wire up through the centre of each one and form a paper floral bouquet. Spritz them with a little perfume to scent them up if that tickles your fancy... or you know if you are simply just as OCD as I am about these kind of things. Happy flower making you guys! DISCLAIMER: Serious House Envy Alert!! !